The first thing I noticed when browsing through Frank Gardner’s marine paintings was the recurrence of the wall motif. In towns — on terra firma — it was people against the walls; here, at sea, it is the boats. But perhaps the artist takes the contrast up a notch, to a level where it mutates into a real clash: that of the sea and the land and that of living on a constant move and in a permanent dwelling placed on the ground. Planes of bright single hue, which formed the walls in the town, stream down into the see and break down into shimmering reflections. The stability and quietude of the city is lost, the inconstancy and irregularity of the sea is gained. Appropriately, the viewing angle positions the observer just on the brink of the two elements, maybe with an insignificant bias towards the sea. This compositional uncertainty translates into an emotional one, as if the painting models an inner conflict by asking us “where do you belong?” The point of the question would be not only to elicit a specific answer from the audience, making each viewer to learn a thing or two about him or herself, but to familiarize us with the ongoing dilemmas of the sailor’s life. For me, these pieces serve as an introduction to a different and precarious way of life — which many communities have led for centuries, thrived, and still continue to do so. 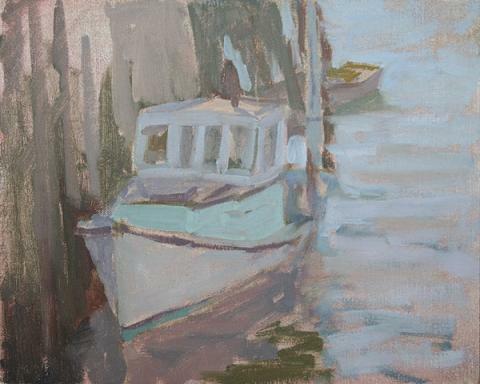 Stylistically, these are sure-handed works — I enjoy the robust, swift brushwork in particular — enriched with impressionistic water reflections. It is strange how a degree of randomness exposes a firm brush where too much thought and planning would do the same to an uncertain one. Here, the generally chaotic distribution of color used to create a believable illusion of the water surface does the former. In other parts, this is impressionism on condition: sunlight emaciated the boats’ color, which seems ready to crack, peel off and reveal the dirty gray and red of metal and corrosion. It’s as if there is some realist intent encroaching, preparing to take over after sundown. Overall, the extremely bright sunlight sets the tone and adds an energizing touch of urgency. 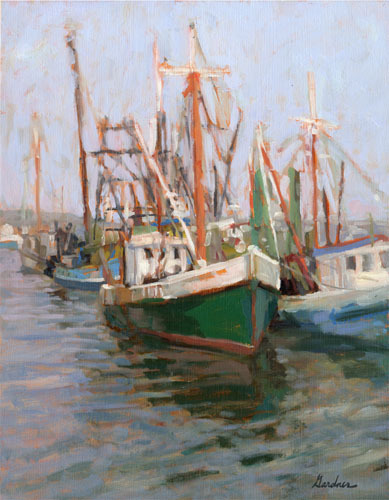 To conclude, I would like to offer a comparison to Todd Bonita‘s much more intimate and calm boat paintings. Although both artists illustrate similar themes, there are several important differences (besides the obvious stylistic ones). First, there is the matter of size: Todd Bonita paints smaller vessels. Second, as a result, it would appear that the latter’s work is more individual oriented, whereas Frank Gardner seeks to describe broader and mass social situations. It’s one fisherman versus a whole fleet; a small creek versus a big seaport. Finally, both artists, while limiting their palette to almost trichromatic, achieve opposing effects of tranquility and bustle. 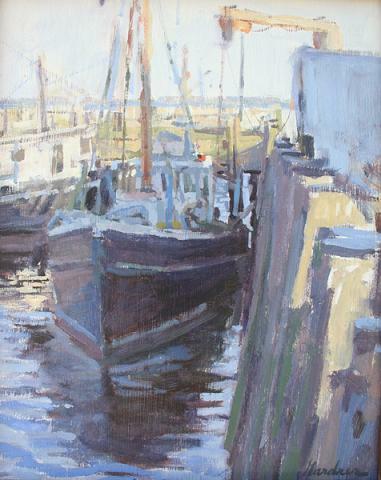 Each painter benefits from the comparison; Frank Gardner’s work stands out as the more worldly and cosmopolitan. I agree with your review that Frank is a sophisticated painter and his work is very high caliber. I enjoy the interaction on the blogs. It seems that the blogging artists are kind and supportive unlike the art world in general.